In less then 3 days since making my move North to my family’s place in Whangerei, I’ve gone from grooming for the rich/elite/ whatever show jumping barn, to roping steers and barrel racing at a local rodeo. Talk about opposite ends of the spectrum! The first few days at my new home were pretty quiet. While everyone else was away at work or studying for exams- I stayed in the house, cleaned (yes mom, I cleaned), and baked. 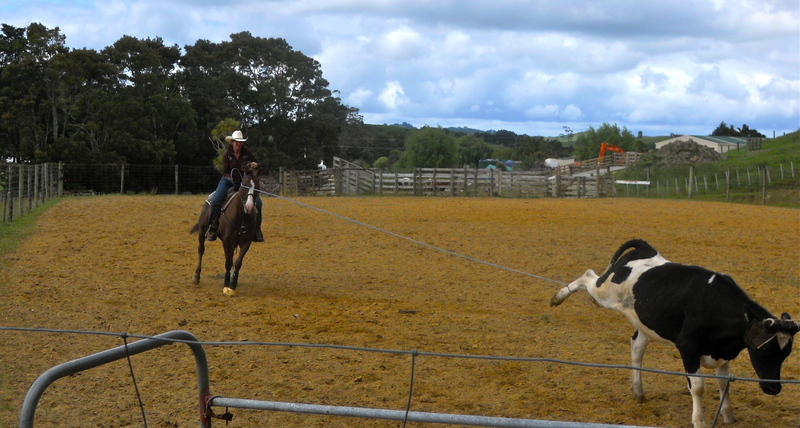 As the weekend came, things got a bit more exciting- roping and barrel time! I went with Alison and Diva, her horse, about an hour and a half to Paparoa where the Northland District Team Roping Club was having a club day. Saturday consisted of practice time for the 5 or 6 of us there. The group joked that I was their new groom- but soon had me practicing heeling with the steer dummy and put me on a horse. Hutch, who’s horse I was riding, was quite surprised when he found I had tacked up the horse in all it’s western gear and hadn’t asked a single question. Who knew the show jumping groom could double as a cowgirl? Thank you 6 years in 4H and numerous western horses I’ve ridden and worked with over the years. Plus, I am Canadian. The first thing I had trouble with was when Hutch told me to “build a loop” in my rope. The response he got was me looking down at the rope in my hands, and promptly back at him with a “uhhh.. whaa?” expression. After a good 3/4 hours of Roping 411, I still don’t have a hot clue how to build a loop. That’s the only thing I really had a issue with. Apparently I’m a natural at the actual roping. I mean- I didn’t actually go full speed, chase down a steer, and rope it. 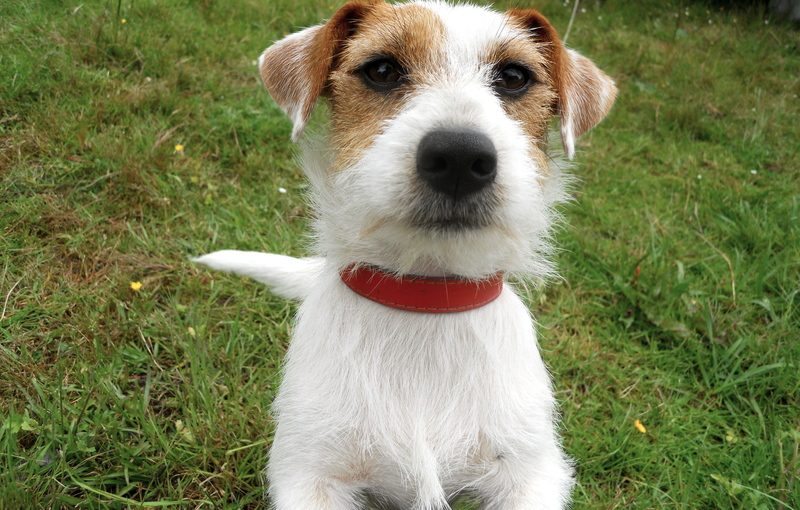 BUT- I did catch a steer by the end of the day… from a walk, and with a lot of luck- I was on a horse, and I threw the rope- so it counts!! It’s definitely not easy. And it’s definitely frustrating. But it’s also addicting! 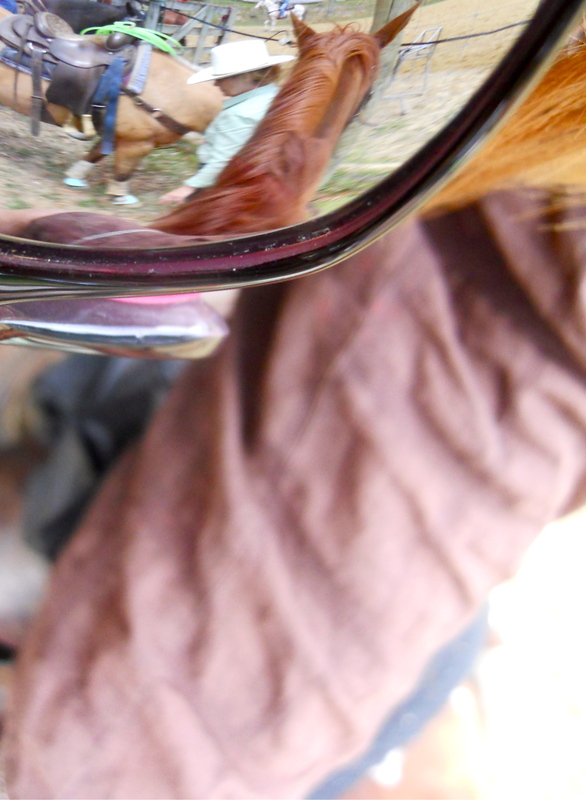 I caught myself quite a few times, and my horse. Who was very patient and knew his job. Thank god. 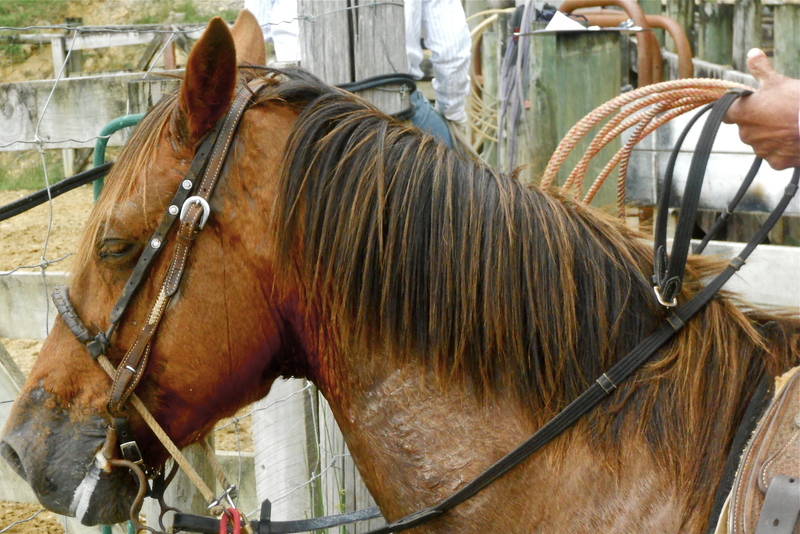 Sunday was a points competition for Team Roping and Barrels, and more people showed up. 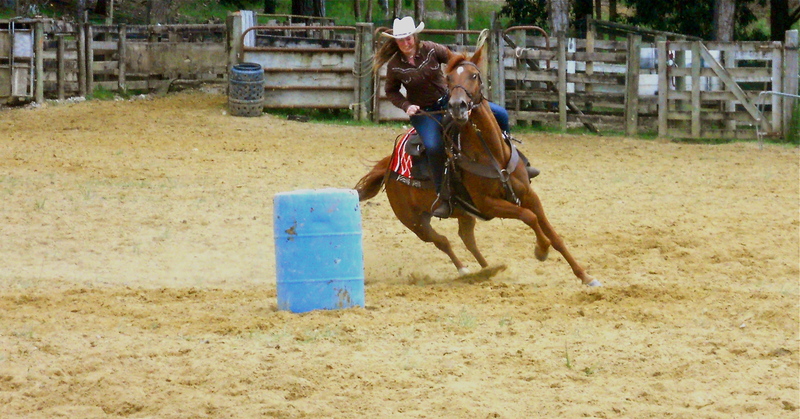 I was put on Hutch’s other, younger, less trained horse to run barrels. 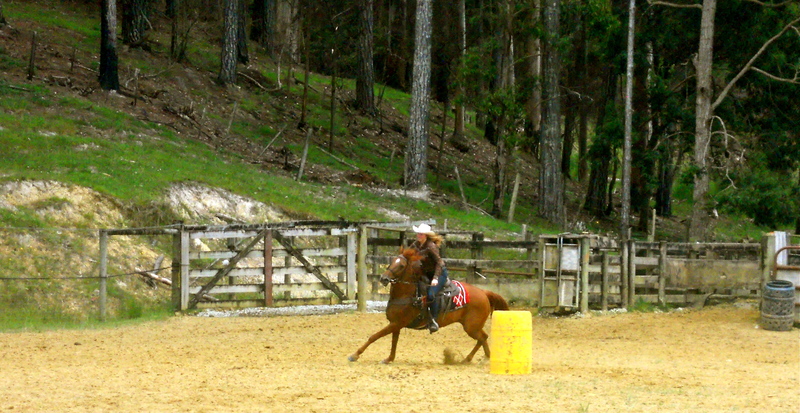 For a kid who has never run real barrels, only the slow (on a pleasure horse) 4H version, running full speed on a young horse that’s never done barrels before- I (according to Alison and other spectators) did quite well. It was amazing to see the differences between what I saw this weekend, and what I’ve experienced on the other end of things. I have to say, the people on this end of things are much more relaxed, easy going, and fun to be around. They were very supportive and so willing to teach me all they could and all I was willing to learn. There was never a face without a smile for too long- everybody was having fun. I was accepted into the “rodeo” family, no questions asked. Before even finding out if I could ride worth anything I was offered a horse to ride for the weekend and went out with the group to bring the steers in from the field. I was lent show clothes so I could compete on Sunday, and trusted enough to be put on a young inexperienced horse. It was said many times over the weekend “everybody here is treated equally”, and that statement was very obvious. Everybody there was at different levels in their riding and skill- but everybody there was equally happy and learning. Nobody was unhappy if they didn’t catch on their runs, because everybody was cheering them on anyway. It was nice to be a part of that sort of community. You don’t often get that in the show jumping world- at least not in such an obvious way. I haven’t seen that many smiling faces at a competition since.. 4H Provincials- the year our team theme was Gangster and the three boys made up that rap for the big supper night. Uncomplicated would be the best word to describe things “on this side” of the spectrum. Simple. Oh, and another bonus? Things don’t get started until 10 or 11 am. Big change from getting up at 5:30 am on show days to work all day and then repeat (I told the group this was what I’m used to.. almost got laughed out of town). I’m being spoiled here! While I did have fun and learn lots while working at LC- I’m realizing stuff like what I experienced the past couple days at the rodeo is almost more valuable to me. I made so many local connections that may play a part in finding me a job- or just as friends in the future. I’ve been reminded many times already that I definitely made the right choice in moving up here. Don’t worry though, I’m not going to come home and turn Willard into a barrel racer. Besides- I don’t think he could handle the rodeo scene. Too many cows. Here are some snapshots from the weekend, click on the picture for a larger view. Next Post From the pages..
Fun! 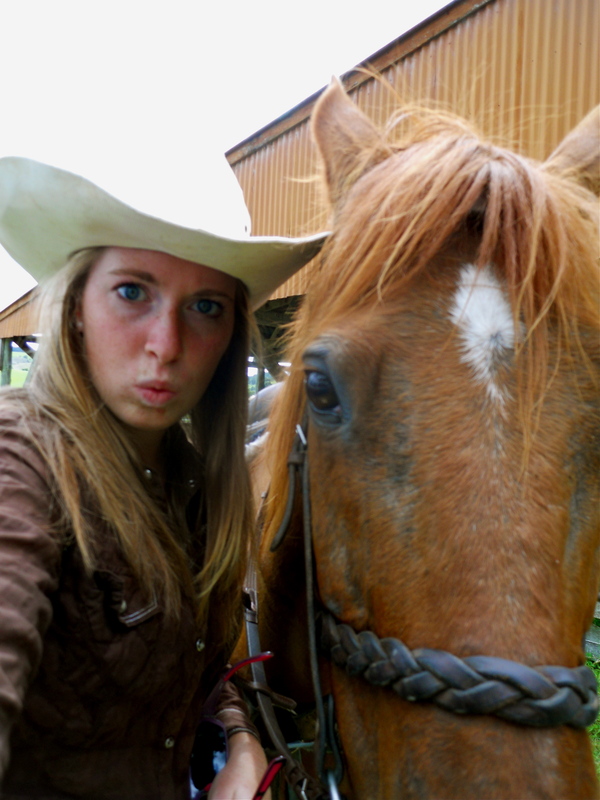 You make a convincing cowgirl. I know I know, reblogging is kind of a lazy way out of this week’s post. My life has taken over my schedule and won’t let go- but I still wanted to get something up for the week. Heart of the Continent is coming up with schooling starting Wednesday and competition starting Thursday so I will make a point of posting through out or at least after that show- the biggest show of the year here in MB! I picked Spectrum to reblog because reading through it I can both relate to some of what my past-self was experiencing, and can find comfort from some of the stress I’m under currently with what I was feeling back then on the rodeo circuit. The past couple weeks have been full of great things, but also some more stressful, hectic things. 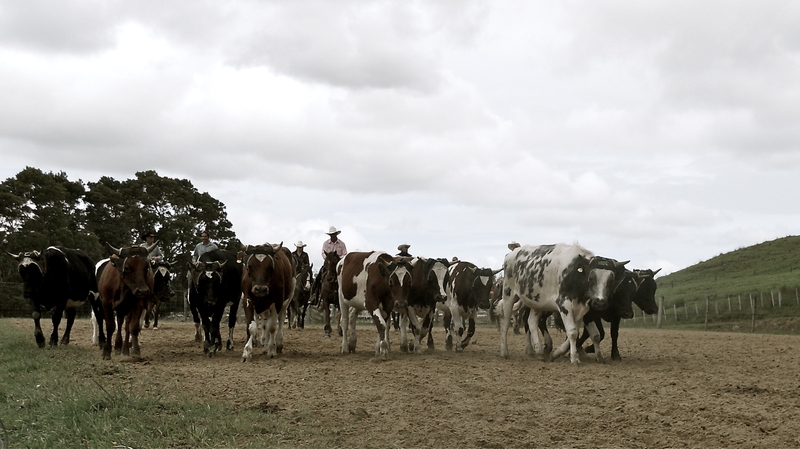 I’m keeping up all right, but sometimes I wish I was off travelling again with the cowboys/girls around NZ. Wish me luck with catching up to myself this week, and enjoy this piece from katmah history!